Your workplace should be designed to make it pleasing to sit and work at your desk. More and more people are making the move to a more modern office look. While many people send a more and more time at the office a comfortable and stylish leather office chair is a must. 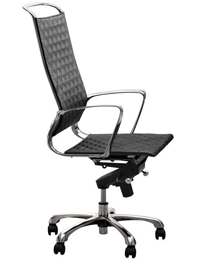 We offer a large selection of modern office chairs including task chairs, computer chairs, desk chairs and executive chairs featuring minimalist lines and style. Find modern office chair to fit your office furniture that's perfect for any home or office. Leather office chairs give great back support for all your employees. An employee that is properly positioned at their desk will be able to work more effectively. There are several style options to choose from while keeping your cost within your budget. You can also expect to benefit from the use of this office chair. Each design is mobile and can easily fit in and out of under a computer desk or table. Check out our selection or contact us with any questions or to place your order for your new modern office chair to complete your office.